With over 20 years of experience as a meeting planner and having produced more than 200 events at venues across the country, we know the level of frustration that can be experienced when dealing with in-house AV companies. Securing the right equipment at a fair price really shouldn't be that difficult. What is this 25% service charge on top of the labor fees?! You want to charge me for equipment rental on the set-up day!? Do I really need that tech who is sleeping in his chair?! I could buy that for what you're charging me to rent! These are all questions we have had as meeting planners ourselves. 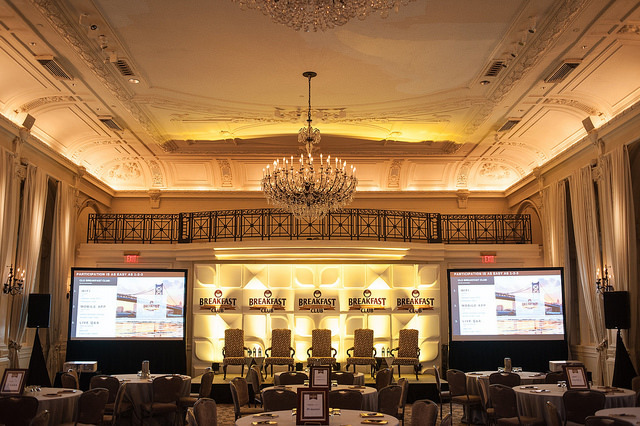 At Show Day Productions, we focus on serving the audiovisual needs of small to mid-size associations, corporate events and employee incentive programs. We have developed popular all-in-one packages to help make the process of producing a flawless show as painless and as cost effective as possible. Your time is valuable; don't waste it having the same conversations event after event with an AV vendor. Show Day Productions is positioned to be your long-term technology partner. Please take a moment to download and review our 2018 equipment and labor price list. While we've created turnkey packages that will accommodate many group needs, we know not every event is alike. Feel free to reach out and schedule some time to review your program and we will be happy to create a customized quote. We have assembled efficient and effective AV service packages that will exceed the expectations you have become accustomed to from in-house providers. We retain the best video, audio, lighting, and staging directors, engineers, leads, and technicians in the markets we serve. Planning events is a difficult and time consuming process. Working with an AV partner should not be.